With the arrival of spring in Sydney I've had a craving for this Jamie Oliver inspired recipe. Salmon is a fantastic source of omega-3 fatty acids which are inti-inflammatory and extremely beneficial to your health - they can help lower cholesterol, reduce high blood pressure, and may reduce symptoms of arthritis and depression. Omega-3s are essential fats that must be obtained from our diet. I like to accompany the salmon with a salsa verde which cuts through the oiliness of the fish. Preheat the oven to 200 degree C. Tail the green beans, blanch them until tender in salted, boiling water, and drain. Put in a bowl with the cherry tomatoes, zucchini and the pitted olives. Drizzle with olive oil and a pinch of salt and pepper. Give the salmon fillets a quick wash under the tap and pat dry with kitchen paper. Squeeze the juice of 1/2 a lemon over the fillets, on both sides, then season both sides with salt and pepper and drizzle a little olive oil over the top. Put your 4 fillets of salmon at one end of the roasting tray and green beans, olives and tomatoes at the other end of the tray. Lay the anchovies over the green beans. Roast in the preheated oven for 10 - 15 minutes, then remove from the oven. Meanwhile whiz up the salsa verde ingredients in a food processor (I like to pulse it rather than make it too smooth) or chop finely by hand. Loosen if needed with 2 tablespoons water. 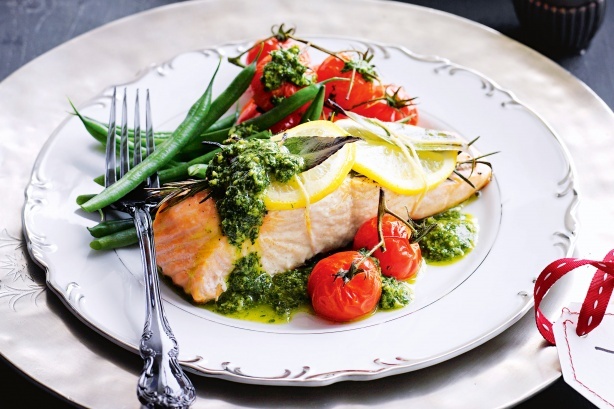 Serve the salmon with the veggies and a dollop of salsa verde.